Really excellent middle-grade science-fiction feels like a hard thing to find these days. This graphic novel more than delivered, offering zany aliens, an intrepid girl explorer and an enjoyably distinctive style. Zita, who seems to be around 10 years of age or so, is a bit impulsive and given to making hasty decisions. After a meteor delivers a strange looking alien device, she teases her brother Joseph and hits the button, and is shocked, overwhelmed and sad when he is sucked into a vortex. Not knowing what else to do, she jumps in after him. She soon finds herself on an alien world, and with Joseph kidnapped, she makes an unlikely alliance with Strong-Strong, a sweet but kind of dumb brute, often bossed around by his levitating, top-hat wearing, cockney-accented boss. Piper, a bit of a rogue and conman, his friend/pet Pizzicato, better known as "Mouse" a gigantic mouse who communicates via ticker tape, as well as H.A.M.B.O. - a Heavily Armored Mobile Battle Orb, otherwise known as One, a slightly dysfunctional battle robot all join her on her quest to rescue Joseph. 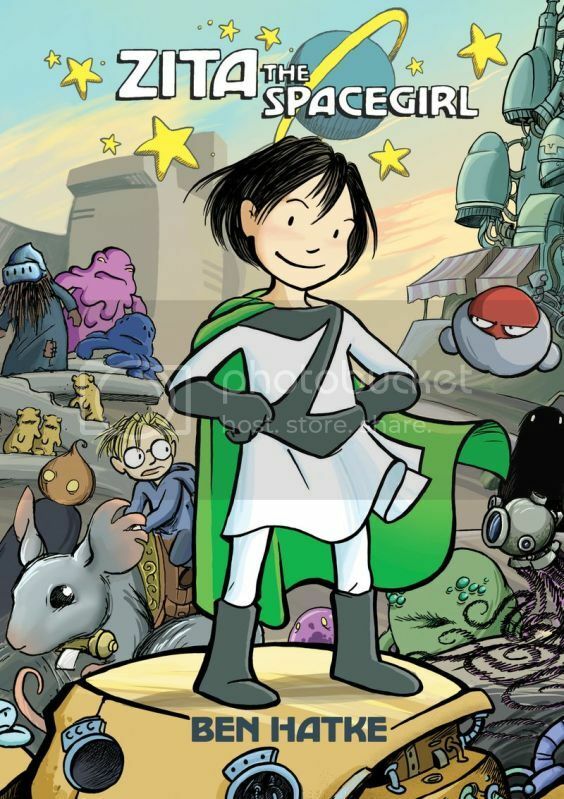 Zita the Spacegirl favorably reminded me of several other recent books: Hereville: How Mirka Got Her Sword, because Zita and Mirka both share the same irrepressible spirit. Zita's quest to find answers and the diverse alien population giving things a Mos Eisley feel reminded me of Eva Nine's adventures in The Search for WondLA. The sense of humor and fast pace made me think of Rapunzel's Revenge and Calamity Jack, a mildly steampunkish retelling of fairy tales. The ending of the book promises more in a series. Fast-paced, fun and accessible, I'd recommend Zita the Spacegirl for a wide range of readers, from 4th through 8th grade. We love Zita in our house! It's great to have an intrepid girl character with such strong appeal to both genders!